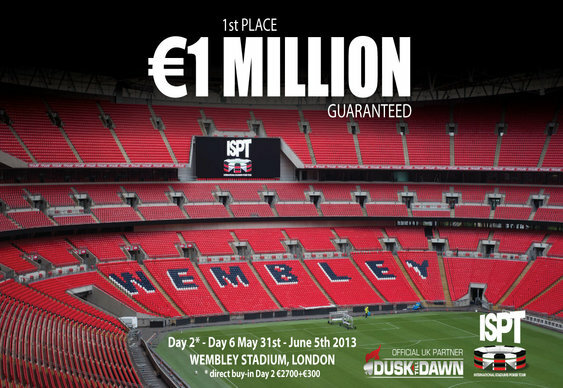 The ISPT Wembley's overlay might have given the organisers a moment of concern, but for the players it meant the chance to make their way into the money and unlock some serious value. Indeed, while the minimum payouts of €540 might not have piqued the interests of the pros left in the field, the 285,000 runner-up prize, on top of the €1,000,000 winner’s booty, has certainly given them something to shoot for. Starting the day with 412 players in contention, a swift start to the session saw the 381st place bubble reached relatively quickly. However, the preceding action was nothing compared to the four-way drama that occurred one place before the money. As the tension of a penalty shootout swept the stadium, four players found themselves all-in and fighting survival at one point. After one of the four survived a crucial pot with pocket jacks against pocket eights, David Gent was all-in with Ad Qs against pocket threes. Despite having good equity pre-flop, Gent’s chances of success soon faded as the board ran out: 4c 3s 2c Ks 2s. Just as Gent was heading to the stands, Tomasz Gluszko was also looking for some help with Ac Qc. This time the fateful hand was against the pocket kings of Rhys Jones and despite not being completely out of contention on the Ks Ts Qs Ah board, Gluszko was unable to catch a slice of luck as the 6d landed on the river. Now into the money, it was time for the tournament’s short stacks to shoot for the fences. With chips flying around the stadium like confetti, it was German pro Ole Schemion who emerged with as the chip leader. After surviving the post-bubble chip storm, Schemion managed to rake in a seven-figure stack of 1,534,000 chips to lead the final 99 players into Day 4. While Schemion’s run put him firmly atop of the overnight leaderboard, today’s session will feature a host of formidable opponents, including Toby Lewis (973,000), Sam Trickett (805,000) and Dave “Devilfish” Ulliot (700,000), are all still in contention. Day 4 will play down to a handful of tables before the tournament’s penultimate session kicks off tomorrow.